Penicuik could be reconnected to the rail network for less than £60m according to the feasibility studies. Below we take an in depth look at the contents, so you don’t have to, however you can also read the documents in full. For ease, this article will be separated into two, the GRIP Stage 2 report and the GRIP Stage 3 report. Before commencing the analysis it is important to note that these reports were undertaken by university students and not seasoned professionals. There may be errors or inconsistencies. One such problem is that the Stage 2 report does not precede the Stage 3 report, as they appear to have different authors. The routes suggested for further analysis at the end of the second stage are not then considered in the third stage. This is unfortunate but highlights that should Midlothian Council fund an official study process, different routes may become apparent to those necessarily selected here. GRIP stands for Governance for Railway Investment Projects and is an eight stage process instigated by Network Rail when considering a new railway line. Stage one looks simply at the region’s suitability for a new line, whilst stage two proposes a wide spectrum of routes, regardless of feasibility, narrowing this down for stage three; the detailed cost and feasibility analysis is then undertaken. Both reports agree that due to the density of the urban fabric within Penicuik, to force a railway line into the town would be costly and these costs would be difficult to recoup over the lifetime of the project. Instead both suggest a terminus outside the main population of the town but still within the boundary and a suitable distance from habitations. As previously explained, the second stage of the GRIP process is to assess the area in which a possible railway will run, suggesting possible routes with only basic considerations purporting to cost or geographical feasibility. Trends north east to Loanhead using mostly former infrastructure. Would connect to Millerhill junction of Waverley Line. Penicuik station likely at Valleyfield. 6.8 miles long in total. Could be constructed relatively quickly with lesser cost but would sacrifice a national cycle route. Heads east north east to Bonnyrigg, connecting to the Borders Railway at Eskbank. Penicuik terminus at Valleyfield, interim station at Bonnyrigg. 6.2 miles long. Could serve larger growing population of Bonnyrigg. Journey time of approx 26 mins to Edinburgh. Trends north towards Fairmilehead and connects to Edinburgh south suburban. Penicuik station would likely be in the north of the town, perhaps off of Rullion Road. Stations could be provided at Bush and Fairmilehead. 9.6 miles of track in total. Heads west of Penicuik and then north west along foot of Pentland Hills. Would run parallel to City Bypass connecting to the mainline at Currie. Journey times could be lengthy though route will have minimal impact on current residential areas, meaning build time could be lower and public support perhaps higher. Trends west out of Penicuik then north into Edinburgh. 10 miles of track. Would not face constraints of joining Borders Railway but could lead to impacts on landscape and residential areas. Freedom of location of Penicuik station, though likely in north. Route would run from Valleyfield but heading south east to the Borders Railway line connecting at North Middleton. Track length of 15 miles then a further 12 miles of Borders Railway would result in a lengthy commute and it would not replace most journeys. Similar to route six but with more stations. Perhaps serving Temple. Problems echo those of six too. This route is the most direct and runs north from Penicuik. A train route would have extensive tunnelling into Edinburgh and would be very costly affecting great swathes of farm, residential and recreational land. Public support would be highly unlikely. It is noted that a Tram/Train solution could be implemented to use current road network rather than tunnelling. It would though mean a commute to the city centre of around 15 minutes, which isn’t possible using any mode of transport currently. Utilises old Valleyfield railway line, reducing costs and impact. Some new developments would have to be navigated around and compulsory purchases would be required to enter Bonnyrigg. A greater number of stations would increase cash flow but commuting time would also increase, making the line less favourable to Penicuik. Heads east of Penicuik connecting to the borders Railway at Gorebridge. 5 miles of new line with easier implementation than many suggestions. Though time to Gorebridge would be 5 minutes, it would be a further 25 minutes on the Borders Railway. Likely to be cheapest option. Terminus at Valleyfield. In addition to these a “Do Minimum” option was considered, not implementing a new railway line. It is noted that a railway line could cost considerably more than the revenue it would generate, leading to a lack of public support. Options to decrease congestion without rail, could be to increase bus provision. 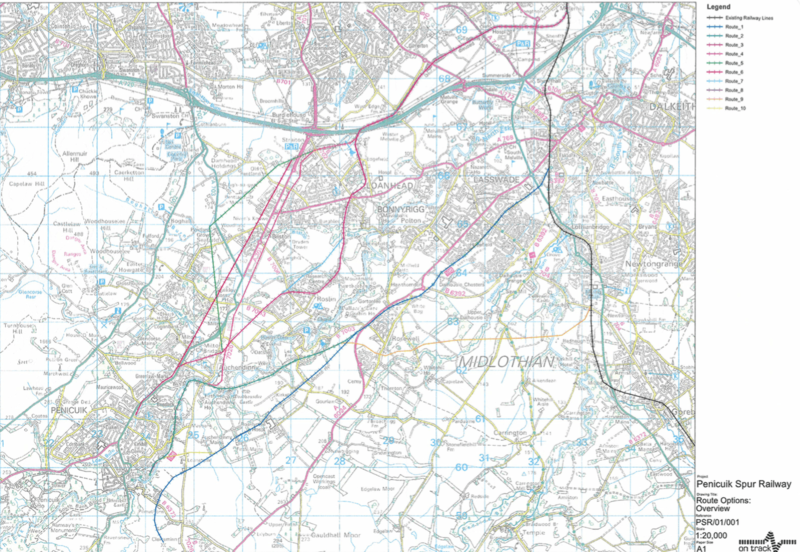 There is no mention of the proposed A701 relief road or other road based solutions. This also applies to GRIP Stage 3. These routes are then narrowed down to five, being: 1, 3, 4, 9 and 10. This is done by considering the economical, social and geological factors. Option 10 was viewed to be most favourable whilst options 1,3 and 4 were least favourable. To select only three routes, route one and four were removed. Route one had more gradient variations than route three, resulting in higher build costs and route four was omitted as it would have a larger impact on the natural landscape. Therefore at the end of the GRIP Stage 2, it is proposed that a route north to Fairmilehead, the old Valleyfield route and an eastbound route to Gorebridge be considered. Unfortunately we are not party to the GRIP 3 that contains more detailed costings for these, though it can be said that the Valleyfield option also emerged as a favourite in the available GRIP 3 meaning that we do have rough costings for this. Route options for GRIP 3 © Heriot Watt. Not for reproduction. The GRIP 2 that preceded this concludes that three routes should be investigated further: Route one, two and four. In addition to this route four is split into 4A and 4B (not shown on map). The report states that aims of a Penicuik Spur would be to alleviate road traffic, boost the economy and reduce commute time. Route one emerged as the favourite and it is proposed that this is considered further in the next stage. This option is a historical one, terminating at Pomathorn and then heading north east past Rosslynlee to Bonnyrigg. It is largely the same to route nine in the analysed GRIP 2 with the main difference being that it runs to Pomathorn not Valleyfield. All in all, the route would be 10.8km long, costing £56,207,190 and resulting in a journey time of 28 minutes to Edinburgh Waverley by connecting to the Borders Railway. The Penicuik station would be in the vicinity of Pomathorn Mill, which would need to be compulsory purchased. It is noted that this lies quite a distance away from the main population of the town, being 50 minutes away from the north of the town by foot. New transport links would need to be created to connect to the station, though for some of the town, journey times, including a bus or car journey to the station, would result in a commuting time similar to the current day one. An expansion to Peebles could be considered to increase revenue flow. An interim station would be provided at Bonnyrigg and could tap into what will become Midlothian’s largest town. Overall 19 structures would be needed along the route, though some of these are existing. Noise barriers would also be required from Rosewell to Eskbank. The net benefit over sixty years would be £1.2M. However, whilst route one was the chosen outcome, the proposed route four also emerged as favourites, having a positive impact on the region, but not recouping its costs within 60 years (under 2014’s calculations). Route four would terminate in Penicuik at a five storey station off of Kirkhill Road. Three floors of car parking would be provided down into the valley, then a single floor for the ticket hall before a final floor for the platforms. The route would then follow the current railway path before turning north at Auchendinny and running up to the east of Bilston and west of Loanhead. At Nivensknowe Road, the route could go one of two ways. Route 4A continues north to the East of ASDA, running along Costkea Way and then to the east of Straiton Retail Park, where it would be served by a station. It then continues to cross the A720 before joining the Waverley line at Millerhill. Line 4B turns west before ASDA, crossing onto the west of the A701. It would have a station north of the current Park and Ride before turning east and across/under the City Bypass. This would have less of an impact on the built environment but would cost more to implement. On that note 4A would cost £58,770,822 and it would take 31 minutes to reach Waverley. Services would run every half hour, or every fifteen minutes if an additional 2km of double track was used. Route 4B would cost more at £63,489,557, taking 32 minutes to get to Waverley. An additional 3km of track would be required for a 15 minute service. The final route considered was route two. This was identical to route nine of GRIP 2 and follows the historical route, again with a large station at Kirkhill Road. It has net negative impact to society over sixty years due to its crossing through many residential areas along with its high construction cost. It would cost £61,967,698 to construct. The primary advantages of Route 1 are the fact that it is a historic route, and as such there is a high degree of certainty that there will be few problems in re-opening the line. The route also passes through the centre of Bonnyrigg and Lasswade, and although this causes some concerns, including noise, it provides a central station which is easy for the commuters to travel to. It is proposed that there would be no initial electrification but that provision be made for upgrading at a later date.